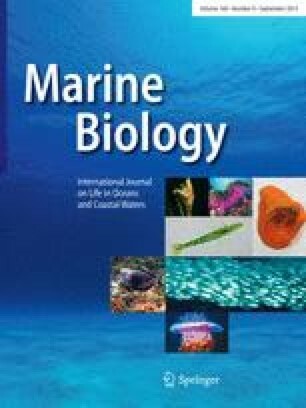 This study explored the spawning dynamics of southern calamary (Sepioteuthis australis) by estimating small-scale temporal and spatial variability in egg production in an area known to attract spawning aggregations. Surveys of the seagrass beds (Amphibolis antarctica) over 14 months determined the timing and location of egg deposition, as well as estimating total egg production and loss of deposited egg masses from the spawning grounds. Egg laying in the inshore seagrass beds occurred predominantly during the austral spring and early summer. Egg production at one location (Hazards Bay) was very similar between the two years, but at the second location (Coles Bay) egg production was threefold less during the second summer. There was considerable spatial variability in egg production among seagrass beds within a kilometre of each other as well as within 10 km. Variability in the use of seagrass beds by the squid during each summer could not be attributed to differences in seagrass density or vegetation cover. Losses of deposited egg masses in the A. antarctica beds were detected on two occasions. On the first occasion the loss was correlated with storms; however, the second and smaller loss of egg masses was not correlated with storm activity. Information about the spatial and temporal patterns of egg production was used to make recommendations about the use of fishing closures to protect spawning adults from over-fishing. This project was funded by an FRDC grant (2000/121) awarded to N.A.M. Thanks to those people who provided field support: S. Willcox, M. Steer, C. Johnson, F. Murray, J. Semmens and G. Ewing. Thanks to M. Lawler for producing maps of the sites and M. Steer for biological drawings.